Whether planning to retire legacy phone systems or already running on Skype for Business, organizations are looking past IM, and present towards exploring other productivity and efficiency gains. The logical first step is Voice. 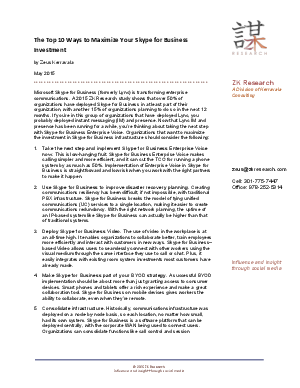 Discover how to take full advantage of Skype for Business in this white paper from ZK Research. 2 ways, for example, are to make Skype for Business part of your BYOD strategy, and consolidate infrastructure. Find out the remaining 8 ways to maximize your investment, and how to make it work for you.